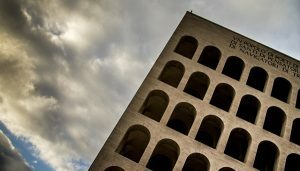 EUR is an acronym for Esposizione Universale Roma and is a perfect example of fascist architecture. Fascist architecture became popular under Benito Mussolini’s rule of Italy from 1922 to 1943. The new modernist style of architecture inspired by Imperial Rome was one way to help build his vision of a unified fascist Italy. The complex, originally called E42, was planned to host a World Fair to celebrate the beginning of the Fascist era. The initial project was presented in 1938 under the direction of Marcello Piacentini. The design was inspired, according to the fascist ideology, to Roman Imperial town planning, with modern elements which came from Italian rationalism. Beside Marcello Piacentini, Giuseppe Pagano Pogatschnig, Luigi Piccinato, Luigi Vietti and Ettore Rossi were the architects chosen to build the project. The Expo never took place due to the Second World War, and the original project was left uncompleted. During 1950s and 1960s the unfinished buildings were completed to be a business district. The Fascist architecture of EUR was prominently featured in Fellini’s La Dolce Vita, Michelangelo Antonioni’s 1962 film L’eclisse, Elio Petri’s The 10th Victim and Bernardo Bertolucci’s 1970 film The Conformist.